An area double the size of Manhattan has been cordoned off as authorities pursue suspects following a coordinated knife attack that killed 60 workers at a northwestern Chinese coal mine, reports the FT. The incident, first reported by Radio Free Asia, occurred on September 18 in the Xinjiang Uyghur Autonomous Region. After overtaking security guards, the attackers killed the workers while they were asleep in bunkhouses at the Sogan colliery in the city of Aksu. The attackers are alleged to be Uyghur separatists. Most of the victims were Han Chinese migrant workers, but according to locals five police officers who responded to the attack were also killed. Aksu residents fear the death toll could be as high as 100. The Xinjiang Uyghur Autonomous Region suffers from discord due to ethnic fault lines. Uyghurs identify more closely with Central Asian nations. The area was independent up to 1949 when it became part of China. China has been asserting is control over the area with more westward migration and a heavier military presence. 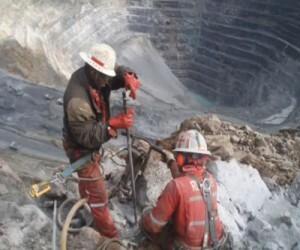 However, the company said this week’s strike caused only minimal disruption to the mine’s operations. 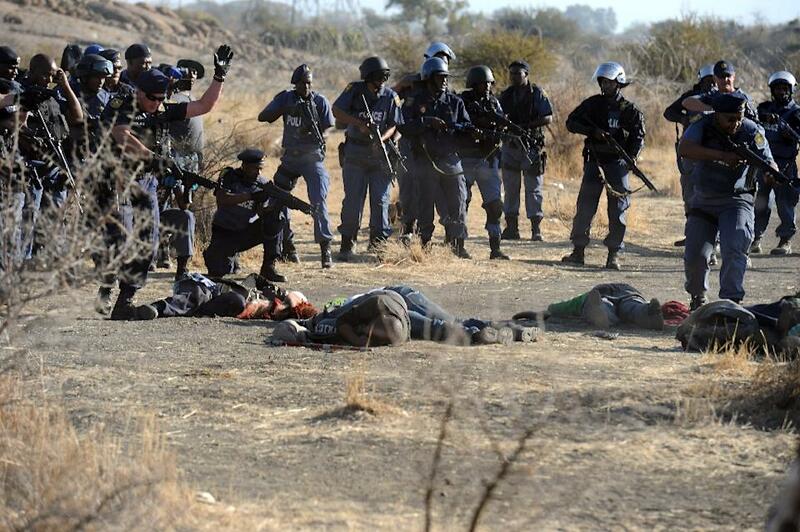 IS APARTHEID ALIVE AND KICKING-READ ON…. 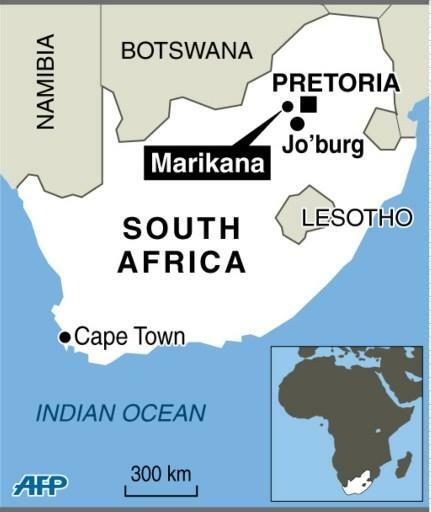 MARIKANA, South Africa — President Jacob Zuma rushed home from a regional summit Friday and announced an official inquiry into a police killings of striking miners that left 34 dead and 78 wounded, an incident that police claimed was just self-defense despite video recordings suggesting the protesters were not attacking them but running from clouds of tear gas. Wives of miners at the Lonmin platinum mine northwest of Johannesburg searched for loved ones missing from Thursday’s shooting and staged a protest, demanding to know why officers fired automatic rifles, pistols and shotguns at the strikers, many of whom had been armed with nothing but spears, machetes and clubs. “Police stop shooting our husbands and sons,” read a banner carried by the women on Friday. They kneeled before shotgun-toting police and sang a protest song, saying “What have we done?” in the Xhosa language. Zuma returned home from a summit in Mozambique and announced an official inquiry into the killings, which he called shocking and tragic. The president headed directly to the mine, 70 kilometers (40 miles) northwest of Johannesburg, where his office said he would visit injured miners in the hospital. Mineral Makeup up to 75% OFF!! Liquidation Sale … While Supplies Last!! Research released by the Bench Marks Foundation, a non-governmental organization monitoring the practices of multinational mining corporations, found that Lonmin had a bad track record with high levels of fatalities and keeping workers in “very poor living conditions.” According to the report released Tuesday, workers often live in deteriorating shacks without electricity. Some children suffer from chronic illnesses due to sewage spills caused by broken drainage. The mining company said earlier that it would withhold comment on the report until the conflict cooled down. Shares in Lonmin PLC fell as much as 8 percent Friday. Since violence broke out last weekend at the Marikana mine, shares have fallen by as much as 20 percent, wiping some 390 million pounds ($610 million) off the company’s market value. The company, the world’s third-largest platinum miner, has also been hit by Thursday’s announcement that Chief Executive Ian Farmer is hospitalized with a serious illness. On Friday, police investigators and forensic experts combed the scene of the shooting, planting multicolored cones and numbered placards to mark evidence amid the dirt and bushes where the shooting took place. Police also searched the rocky outcropping where thousands of miners had gathered daily to strike. People gathered at hospitals in the area, hoping to find missing family members among the wounded. 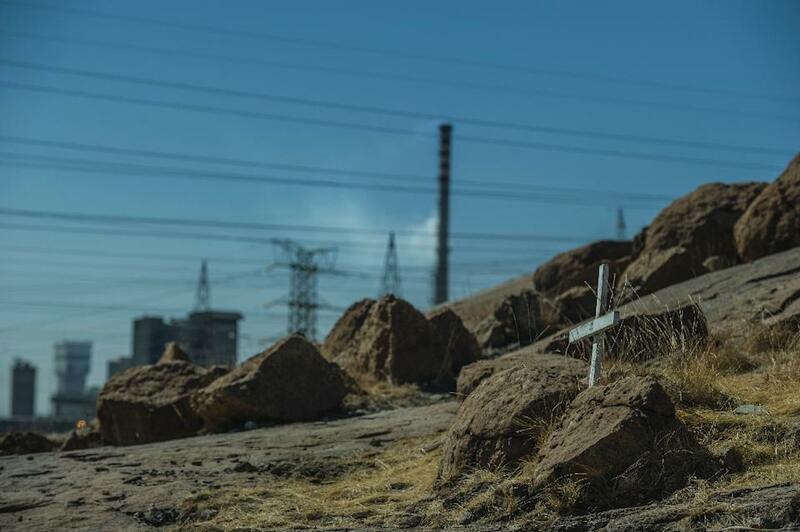 At the scrubland scene of the killings, a woman carrying a baby on her back said she was looking for a missing miner. “My husband left yesterday morning at 7 a.m. to come to the protest and he never came back,” said Nobantu Mkhuze. While the initial walkout and protest focused on wages, violence has been fueled by the struggles between the dominant National Union of Mineworkers and the upstart and more radical Association of Mineworkers and Construction Union. NUM secretary-general Frans Baleni has said that some of his union members were on a hit list, including a shop steward killed Tuesday by strikers. Poor South Africans protest daily across the country for basic services like running water, housing and better health and education. Protests often turn violent, with people charging that leaders of the ruling African National Congress party have joined the white minority that continues to enrich itself while life becomes ever harder for the black majority. The ANC’s youth wing argues that nationalization of the nation’s mines and farms is the only way to redress the evils of the apartheid past. Zuma’s government has played down those demands. You are currently browsing the archives for the MURDER KILLINGS HOMICIDE category.